In the middle of July 2015, three Spanish journalists crossed the Turkish border into Syria. It was Antonio Pampliega’s twelfth trip into the area but he sensed that this time something was different: a truck blocked their way and six armed men emerged from the back, screaming at them to get out of their car. It soon became clear that their contact had betrayed them. Ten months passed before they were released. Almost 300 days of imprisonment of which Antonio Pampliega bore the brunt: between October 2015 and the day he was finally released on 7 May 2016, his kidnappers, a branch of Al Qaeda in Syria, kept him isolated believing him to be a spy. During that time, he was threatened, beaten up and humiliated. 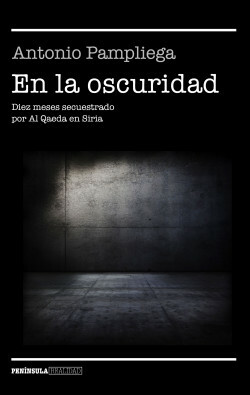 In this book the Spanish journalist tells the story of his kidnapping for the first time. With no-one to share the anguish of his situation, Antonio Pampliega tried to keep his spirits up by writing – and memorizing – a diary in which he prayed day and night that his colleagues were still alive and that they would all one day be released. With this text Antonio hopes to lend a voice to those who survived the ordeal, and those who didn’t.